SABAH Deputy Chief Minister Tan Sri Joseph Pairin Kitingan says Sabah would be developed into an internationally recognised destination of choice in Asia for business and leisure by 2025 under the 18-year Sabah Development Corridor (SDC) Project. "Tourism, logistics, agriculture and manufacturing sectors will be the main focus of SDC, and shall be guided by the NKEA in line with its key factor endowments," said Pairin when addressing more than 100 delegates from Malaysia and China at the 7th Malaysia-China Joint Business Council Meeting in Jinan, China, yesterday. He was here with ministers, assistant ministers and officials from the state government and corporate leaders from Sabah to attract Chinese investment in the SDC project. When elaborating on tourism development under the project, Pairin said, the Sabah government would turn the state as a target of high-yield and long-stay visitors, with premier eco-adventure destinations, as well as a high-end second home destination with luxury holiday villas and lifestyle activities. "Offshore islands and Kinabalu Gold Coast Enclave will be developed into high end signature resorts, together with new eco-tourism products such as wildlife safari, rainforest interpretation, island hopping and submarine diving," he said. Lifestyle products like Mt Kinabalu lookout, MICE (meetings, incentives, conventions, exhibitions) facilities, marinas, holiday homes, spas, wellness, healthcare centres, boutique resorts, performing arts, handicraft centres and art galleries will also be built. 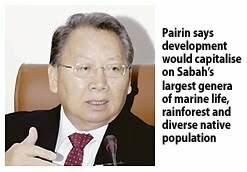 He said, development would capitalise on Sabah's largest genera of marine life (cradle of coral life), oldest rainforest and colourful and diverse native population, Agro-tourism in the interior districts and wellness tourism in the highlands. "Handicrafts and home stay will also be actively promoted to encourage local participation in tourism. To achieve this ends, a handicraft village will be established and new handicraft products such as leather craft will be introduced," he said. As Kota Kinabalu acts as the main gateway for tourists arriving in Sabah, the waterfront area would be rehabilitated and re-developed into an iconic attraction, added Pairin. Earlier at a meeting with officials of the Jinan Hi-Tech Industrial Development Zone, Pairin invited Chinese officials to visit Sabah and look for investment opportunities in the state. He said, investors can focus on four key sectors, namely agriculture, tourism, logistics and manufacturing. An upcoming private commercial development project totalling RM60 million in Sibu is expected to spur greater development in the surrounding areas of the airport here. The project, to be undertaken by Sunhill Development Sdn Bhd, will see the development of a RM35 million nine-storey hotel, a RM5 million two-storey food court and 20 units of shophouses worth RM20 million. Joseph Ting King Sung, Sarawak Housing and Real Estate Developers' Association (SHEDA) president, said the project is expected to be completed in five years time by Sunhill, a company related to his Joseph Design and Contracts Sdn Bhd. He also said the properties, to occupy high grounds at the 23rdkm of Tun Abdul Rahman Road, will be free from any flood problem. Ting was speaking at a press conference to announce SHEDA Home and Property Roadshow Sibu 2010 yesterday. The three-day roadshow from July 27-29 will be held at Wisma Sanyan in Sibu in conjunction with the upcoming Merdeka Day celebration. "To date, 60 per cent of the total of 23 booths have been booked, with a 10 per cent discount given to members of SHEDA," Ting said. "In view of the economic recovery, this should be the best platform for developers from Kuching, Miri and Sibu to introduce their housing packages," he added. 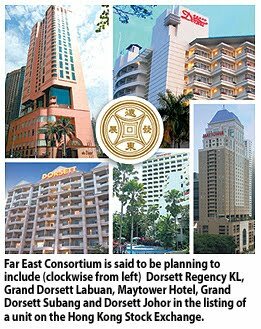 Hong Kong-based Far East Consortium International Ltd (FEC) plans to include all five Malaysian hotels in a planned listing of its unit on the main board of the Hong Kong Stock Exchange, sources say. It is understood that the Malaysian hotels have a combined value of about RM600 million. They are Dorsett Regency KL, Grand Dorsett Subang, Grand Dorsett Labuan, Dorsett Johor and Maytower Hotel. Collectively, they made a pre-tax profit of HK$55.03 million (RM22.74 million) on revenue of HK$237.23 million (RM98.04 million) for the year to March 31 2010, according to FEC's latest annual report. On June 30, FEC submitted an application to list Kosmopolito Hotels International Ltd on the main board. FEC's deputy chairman and chief excutive officer is Tan Sri David Chiu Tat-cheong. According to the listing request documents, FEC, which now wholly-owns Kosmopolito, plans to maintain over 50 per cent equity in the company once the spin-off is completed. Kosmopolito is described as a developer, owner and operator of value to upscale and boutique hotels in Asia with a strong presence in Hong Kong and Malaysia and a primary focus on expansion in China. It is also involved in hotel investment, operation, management and development. It now owns and operates seven hotels in Hong Kong. The listing will help FEC raise funds to support organic growth and acquisitions and separate the business of property development from hotel investment, operation and management. Sources also said the listing is due to take place in the last quarter of 2010. FEC's chief financial officer Bill Mok declined to speak to Business Times, pending the company's planned listing. In 2008, it was reported that FEC was planning on a real estate investment trust (REIT) listing that would include the Malaysian properties. However, this did not happen. The same year, it announced that it was delaying a planned REIT in Hong Kong, comprising seven hotels, to raise HK$4 billion (RM1.65 billion). As at March 2010, FEC operates a total of seven hotels in Hong Kong, two hotels in China and five hotels in Malaysia with a combined total of over 3,600 rooms. The five Malaysian hotels have a total of 1,407 rooms. The group also has eight hotels in various stages of development, including five in Hong Kong, two in China and one in Singapore, representing an additional 2,752 rooms that will bring its total number of hotel rooms to 6,356 rooms by 2013. PETALING JAYA: Sunway REIT, which made its debut on Bursa Malaysia on July 8, has set a new industry benchmark in the local real estate investment trust (REIT) market (M-REIT) by adopting best practices in its business model, market disclosure and corporate governance practices. Sunway REIT is the largest in the country in terms of asset value at RM3.4bil. It has a total gross floor area of 8.1 million sq ft and a market capitalisation of RM2.4bil, which represents about 28% of the total market capitalisation of M-REIT. The trust’s eight assets comprise Sunway Pyramid Shopping Mall, Sunway Carnival Shopping Mall, SunCity Ipoh Hypermarket, Sunway Resort Hotel & Spa, Pyramid Tower Hotel, Sunway Hotel Seberang Jaya, Menara Sunway and Sunway Tower. According to Sunway REIT Management Sdn Bhd chief executive officer Datuk Jeffrey Ng, with three hotels in its portfolio, the management company has signed hotel master lease agreements with Sunway City Bhd’s subsidiaries, Sunway Resort Hotel Sdn Bhd and Sunway Hotel Seberang Jaya Sdn Bhd, to mitigate fluctuations in the hotel’s cyclical business. “The rental-guarantee floor will ensure the minimum rental for Sunway REIT’s 1,190 hotel rooms. Meanwhile, there is no limit as to how high the rental can go when the hotel market turns for the better, which will on the overall benefit the REIT’s income streams,” Ng told StarBiz. He said Sunway REIT was also the first local REIT to subject its IPO offer to a market price mechanism as well as allowed its asset valuation to be determined by the REIT’s prevailing unit price. Before the international roadshow for Sunway REIT commenced last month, the REIT manager signed up reputable cornerstone investors including the Government Investment Corp of Singapore, The Employees Provident Fund, Permodalan Nasional Bhd, and Great Eastern Life Assurance (Malaysia) Sdn Bhd, which collectively have confirmed allocation of about 14% stake in the REIT. It also adopted an over allotment or green-shoe option that came up to 87 million units that will function as a stabilisation mechanism during the one month “stabilising” period until Aug 8. “We have also proposed for up to 50% of the management fees to be paid in Sunway REIT units and this practice shows that the management company is confident in the REIT’s performance. This should translate to about 10 million units a year,” Ng said. To attract more global investors, Sunway REIT is working towards being included as an indexed REIT by the Brussels-based European Public Real Estate Association (Epra) and the National Assocation of Real Estate Investment Trusts (Nareit) of the United States. According to Ng, institutional REIT investors including pension and insurance funds, track these global standard index and use it as a benchmark to guide their investment decisions. “With RM1.56bil worth of free-float units, big global investors will be attracted to invest in Sunway REIT because of its liquidity. Once accepted as the benchmark indexed REIT for Malaysia, Sunway REIT will be in the global investors’ radar screen,” Ng pointed out. 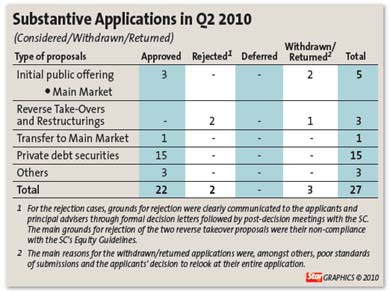 Based on the institutional offer price of 90 sen a unit, Sunway REIT offers a yield of about 7.5% for institutional investors for the financial year ending June 30, 2011. Retail investors can look forward to a distribution yield of 7.66%, which is higher than the 6.9% yield disclosed in the prospectus. The IPO raised RM1.56bil (including the over allotment of 87 million units at RM78mil), of which 44% or RM680mil were subscribed by foreign institutional funds. Ng said although Sunway REIT had a diversified asset portfolio, some 70% of its asset value and 67% of revenue would be from retail assets, which showed that Sunway REIT was a retail-focused REIT. The three retail assets have total net lettable area of 2.4 million sq ft and asset value of RM2.4mil, making it the largest retail-focused REIT locally. “Both the retail and institutional investors are looking at broader and longer-term investment horizon. Being a defensive REIT, unit-holders can look forward to a longer-term growth catalyst as well as low risk and stable yields. As long as its cashflow remains strong, the dividend payout will be 100% of total net distribution income,” Ng added. PETALING JAYA: QSR Brands Bhd has acquired 1.947 million units in KPJ Real Estate Investment Trust (REIT) from the open market on July 20 for about RM2.012mil. The purchase was funded via internally generated funds. QSR said in a filing with Bursa yesterday that the acquistion was based on better return on investment of about 7.3% (based on current dividend yield) as against the current fixed deposit interest rate of about 2.5% to 3.0%. KPJ REIT is managed and administered by Johor Corp Bhd subsidiary, Damansara Assets Sdn Bhd. Johor Corp also owns 50.35% stake in Kulim (M) Bhd, which in turn has a 61% stake in QSR.